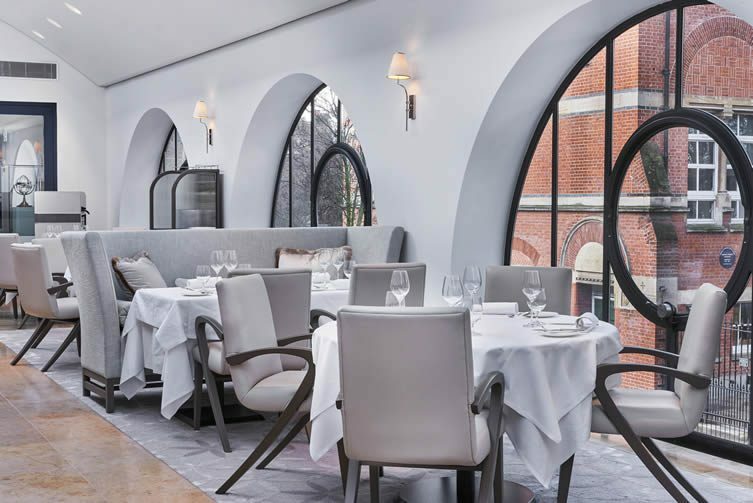 London’s Orrery—an iconic restaurant in the heart of the city’s posh Marylebone neighbourhood—celebrated its 21st anniversary this February, an elegant facelift by designer David D’Almada of acclaimed studio Sagrada its birthday gift to itself. 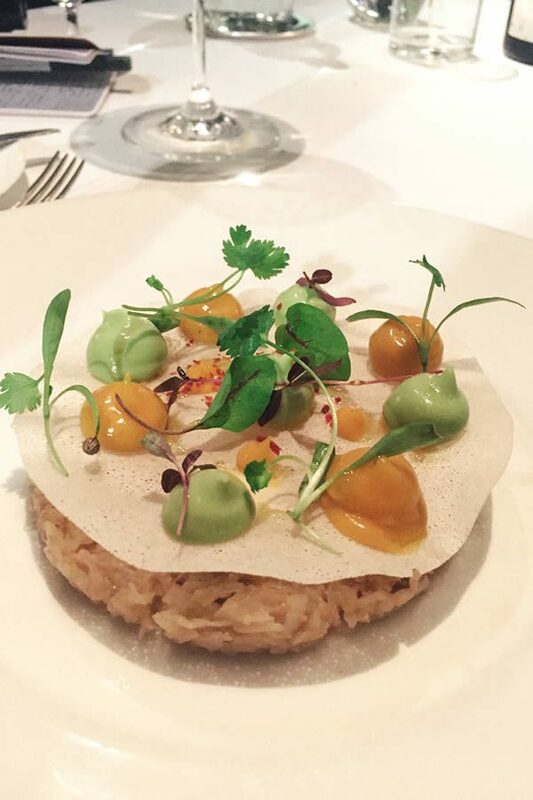 We start our life-affirming feast with a heavenly dish of Dorset crab, wasabi avocado, and mango that evokes thoughts of the South Pacific. On the first floor of a converted red brick stable block, Orrery boasts a cigar and cocktail bar, a roof terrace, and a long catwalkesque dining room with church views. 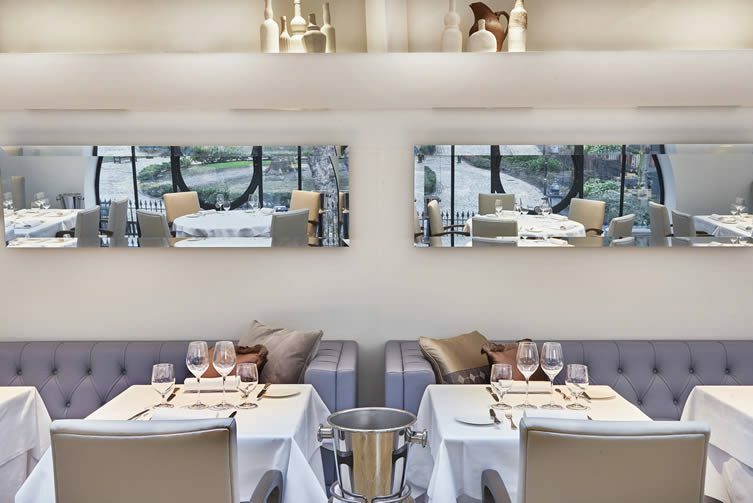 For the redesign, inspiration comes from the south of France with lavender panels, whilst pale variants of white and grey prevail in the contemporary, yet comfortable interior, boasting clean lines that contrast with original arched windows and soft textiles. Once inside, guests are greeted with a glass of Francinet Remy Champagne. Everything fresh and new, you can tell that the team is very proud of the revamp. Chef-patron Igor Tymchyshyn designs the classic French menu with a contemporary and well-travelled twist. Training in Michelin-starred kitchens, chef Igor earnt his stripes with two names who need no introduction: Jean-Christophe Novelli and Marco Pierre White. 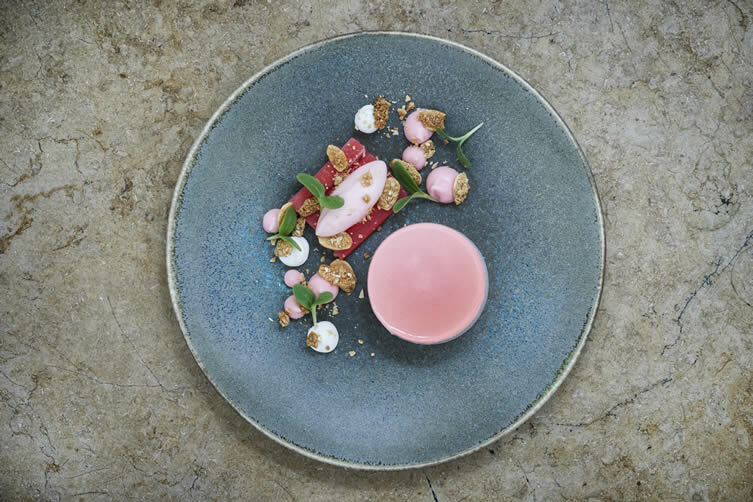 While international touches add a little something extraordinary to the menu, seasonality is also at the forefront of Orrery’s balanced offering. We start our feast with heavenly Dorset crab, wasabi avocado, and mango that evokes thoughts of the South Pacific. The other starter—an earthy and surprisingly light potato and truffle ravioli with wild mushroom and butter emulsion—feels thousands of miles away in the direction of eastern Europe. Julio, our modest and very likeable sommelier pairs the two contrasting dishes with a duo of exceptional wines: the elegant and fruity Etienne Sauzet Bourgogne Blanc La Tufera for the crab, and a superb Cenatiempo Forastera for the mushroom. Working closely with David D’Almada of Sagrada, the furniture, artwork and textiles take inspiration from the south of France with details of lavender panelling and handmade terracotta clay pots. The dining room has muted tones of grey, blue and lilac throughout. 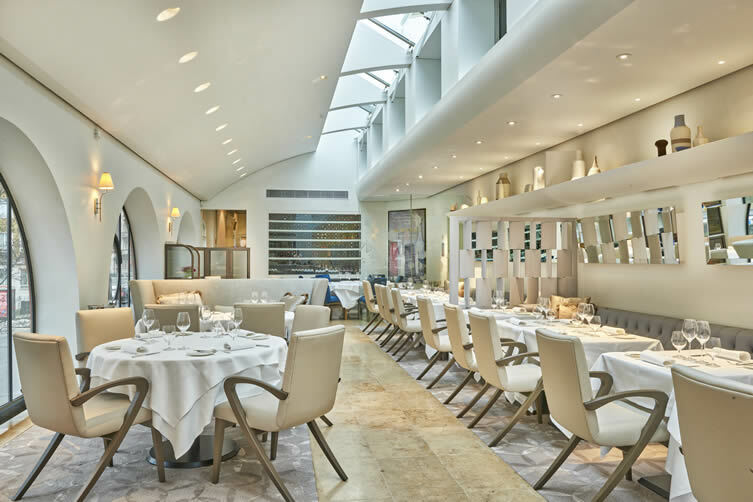 The space is brightened by the floor to ceiling arched windows, framing the St Marylebone Church courtyard, and flooding the restaurant with natural daylight. The Tournedos Rossini with celeriac and périgourdine sauce is my accomplice’s favourite dish of the year. Maybe even his lifetime. My sea bass is on another level entirely. 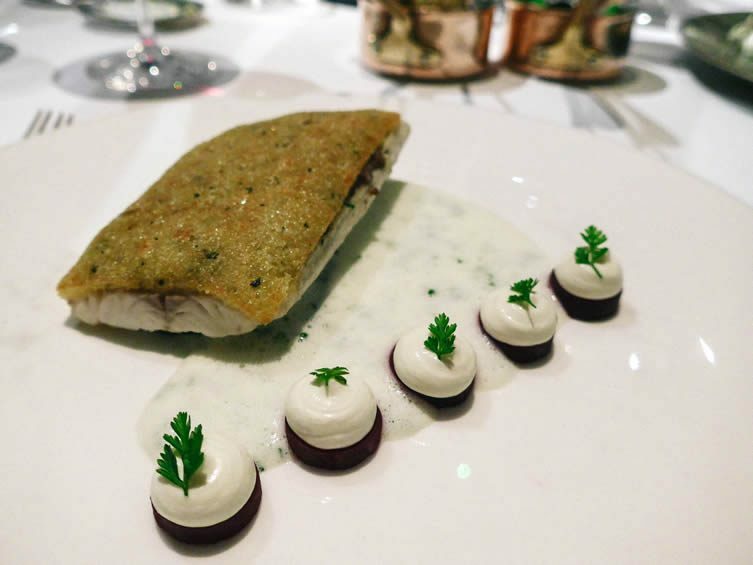 The creamy fillet of generous proportion comes with a layered crust of wild mushroom, beetroot, horseradish, and chive with a crispy finish. Altogether scrumptious, it is not only a thing of beauty but delicate; flavours bursting out of each mouthful. Bowled over by the evening thus far, we can’t say no to one of London’s favourite cheese trolleys. 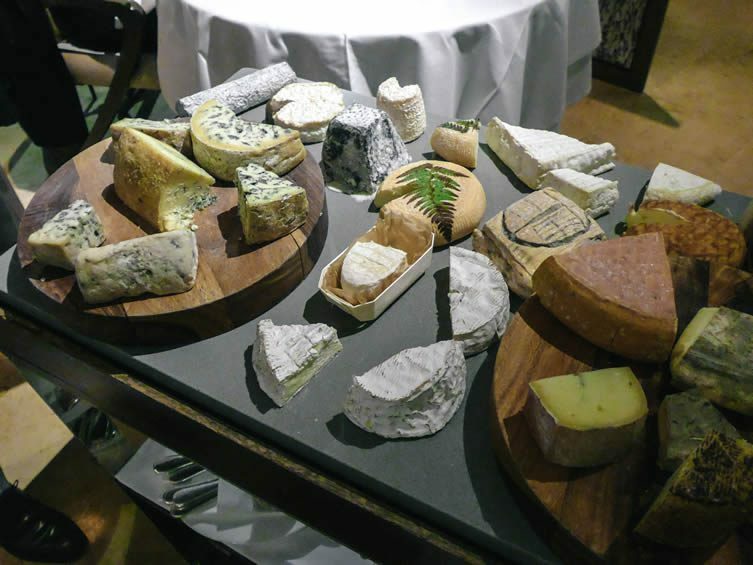 With over 30 artisan cheeses to choose from, visitors are likely to be floored by the impressive selection and aromas. Bowled over by the evening thus far, we can’t say no to one of London’s favourite cheese trolleys. 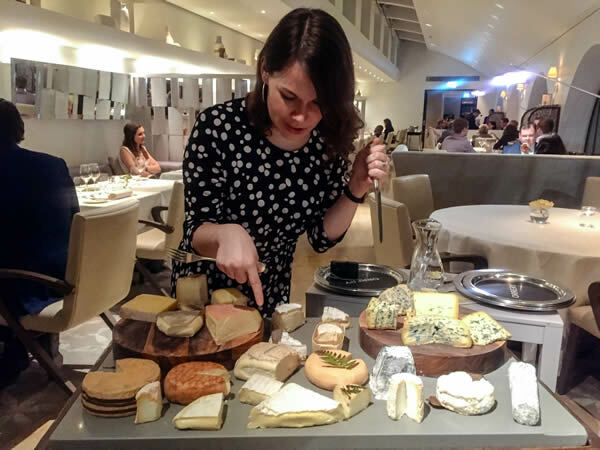 With over 30 artisan cheeses to choose from, visitors are likely to be floored by the impressive selection and aromas. On the recommendation of the animated and auspicious Maître d’ Mathieu, we try one of France’s oldest cheeses. Not literally—of course—but the Fourme d’Ambert, a blue cheese from Auvergne, comes via a recipe that allegedly dates back to Roman times. The Venaco mountainous sheep cheese from Corsica is delightful, and the brine-washed Secret du Couvent cheese from Pays de la Loire creamy and sweet. If opting for cheese, it’s almost impossible not to pair with dessert wine. Sample the 20-year-old Graham’s Tawny Port, the superb Castelnau Sauternes 2005, and the Coteaux du Layon, Domaine des Deaux Arc. You are in for a treat. In a haze of deliciousness, our evening concludes with a Valrhona Manjari single origin Madagascan chocolate délice. The tangy and fruity dark chocolate delight comes lovingly paired with pineapple and salted caramel. So much detail has gone into it—and, for that, every other aspect of the meal—that we are entirely wowed by the whole experience. 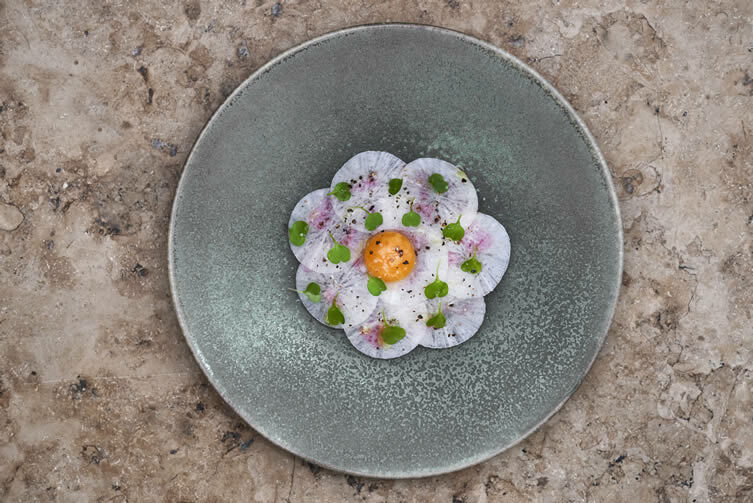 Orrery retains its charm, expertise, and passion for exceptional ingredients, while the personable service and outstanding menu lifts the dining experience to another level. 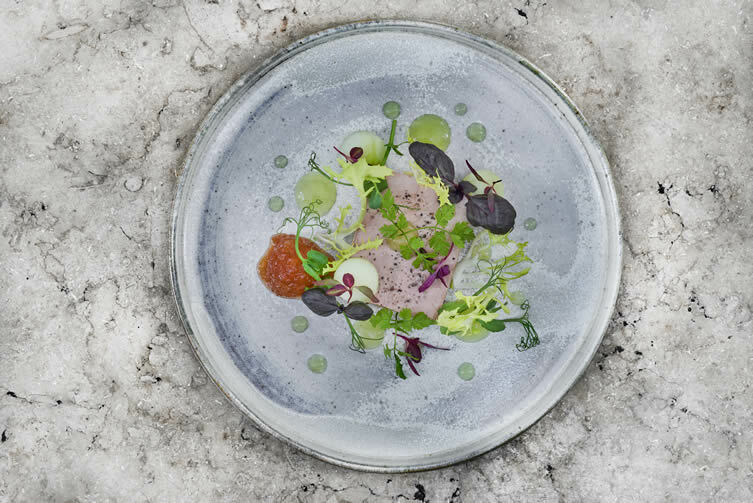 This is gastronomy like no other.